I've had something on my mind lately. It's been about children and how the neglected garden reminded me of neglected children. Now... parts of the garden looked ok. Things were coming up. Parts were blooming, but underlying there was the weed situation, the 'crab grass' that was coming up and swallowing everything and would have swallowed everything had we not went to battle. We had done just enough to look like we were actively gardening until the almost 2 weeks of neglect happened. Is that what I'm, *we* are doing with our kids? Doing just enough to look like we are active in our kids life? Giving them stuff? Taking them places? What is likened in my mind is this. Are we spending 'just enough' time with our kids. Or, are we cultivating them? Putting them on straight paths? Helping them grow up straight and tall? Giving them enough pruning to help them bear fruit? It's tough, the garden needs constant attention. Not constant money or fancy adornments... just time and attention. Same with relationships. Our children need us. Not money. Not fancy gadgets. Not trendy clothes. Not clubs or teams or recreation... Just time to make a relationship that will last. Do I know my kids? Do my kids know me? Do they trust me? Can they talk to me? Confide in me? Do I have their heart, do they know that their father and I have their best interest? Heaven knows my kids aren't perfect, nor am I? But my hearts desire is to bring my children up to know the Lord, to walk in His ways and to bear fruit for His kingdom. As I have pondered over this 'likening' I have realized I haven't been doing enough to make that relationship grow. Too often we get caught up in 'doing', 'going', 'having'. I want to establish contentment in their hearts to know that enough is enough. They are wonderful, they are enough, they are great... just the way they are. Just as this Clematis of mine is in it's most beautiful state. It's because I have pruned it, I have stayed close to it. 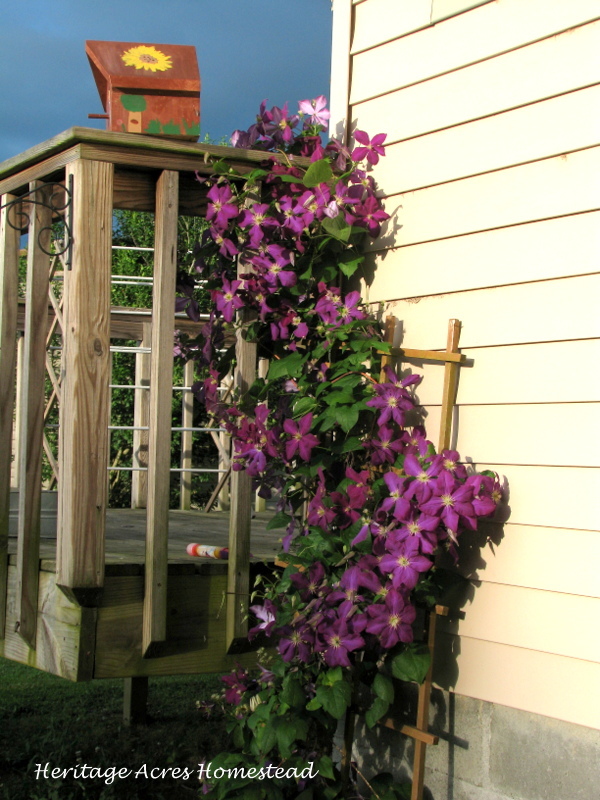 I have worked it through the trellis to make it stand and grow and point to the sky. This is my purpose. This is my task, for my children... and time is fleeting. Yes, it will take time to pull away the weeds, the crab grass, the entanglements... but something beautiful is bound to come out when I do.